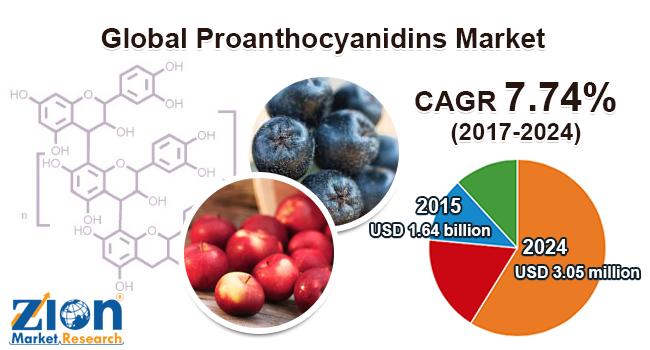 With the presence of a large pool of participants, the global proanthocyanidins market is displaying a highly competitive business landscape, finds a new research report by Zion Market Research (ZMR). NOW Health Group, Inc., Bio Botanica, Inc., Ocean Spray Cranberries, Inc., IL Health & Beauty Natural Oils Company Inc., Swanson Health Products Inc., and Atrium Innovations Incorporation are some of the key vendors of Proanthocyanidins across the world. These players are focusing aggressively on innovation, as well as on including advanced technologies in their existing products. Over the coming years, they are also expected to take up partnerships and mergers and acquisitions as their key strategy for business development state the Proanthocyanidins market study. Citing an instance, in May 2018, scientists working at Baylor Scott & White Research Institute demonstrated that oligomeric Proanthocyanidins derived from French Grape Seed Extract VX1 can help in the prevention of colorectal cancer stem cells formation and thus suppresses tumor activity. In yet another instance that can positively influence Proanthocyanidins market, in April 2017, a study published in Molecular Nutrition and Food Research revealed that Proanthocyanidins rich extracts of grape seed have the ability to protect intestines from fatal effects of a high-fat diet. As estimated in this report, the global Proanthocyanidins market stood at US$ 1.64 billion in 2015. Witnessing a tremendous rise during the period from 2017 to 2024, the revenue in this Proanthocyanidins market is expected to reach US$ 3.05 billion by the end of the forecast period. “Antioxidants and other therapeutic features are likely to benefit the growth of Proanthocyanidins market in the years ahead,” says the author of this study. Apart from this, massive application of the product in food & beverages, personal care & cosmetics, and dietary supplements is projected to boost the scope of Proanthocyanidins market over the forthcoming years. In addition, the product finds a spectrum of applications across various sectors and offers health benefits to consumers. Proanthocyanidins help in strengthening capillaries, reducing blood pressure, and slowing the progress of diabetic retinopathy. This, in turn, is likely to generate lucrative avenues for Proanthocyanidins market in the years to come. Regionally, Asia Pacific has been leading the worldwide Proanthocyanidins market and is anticipated to continue on the dominant position in the years to come, states the Proanthocyanidins market study. Massive demand for food rich in Proanthocyanidins and cosmetic items is the main factor behind the dominance of the Asia Pacific Proanthocyanidins market. Increase in the level of product consumption and high purchasing power of the consumers is another key factor that is supporting the growth of this regional Proanthocyanidins market. In addition, rapidly altering lifestyles of the population of the region is expected to contribute substantially towards the Asia Pacific Proanthocyanidins market size in the ensuing years.